Moira-based Tea Room Quirky Bird is now under new ownership with Stephen Coulter expressing his delight at preserving and further developing it as part of the local community. 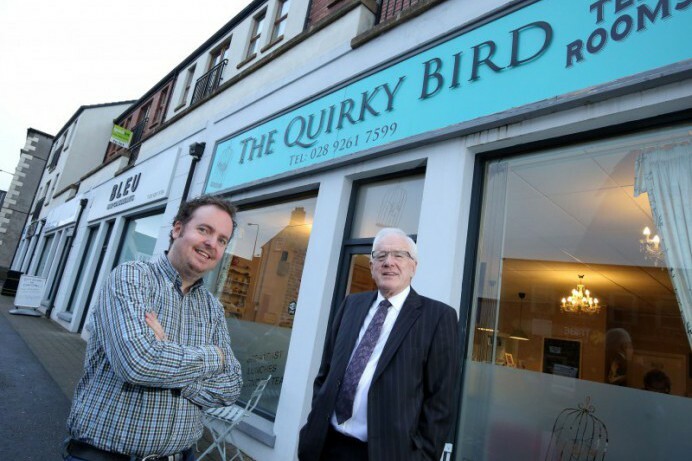 The Quirky Bird has been a firm favourite in the village for a number of years and Vice-Chairman of Lisburn & Castlereagh City Council’s Development Committee, Alderman Allan Ewart, MBE, recently met Stephen to congratulate him on his latest venture. The Quirky Bird is located in Meeting Street, Moira and specialises in delicious home cooked food, home-made scones and tray bakes and a wide variety of teas and coffee. It is open Monday to Friday from 8am for breakfast and until 8pm on a Wednesday and Thursday evening. The Council’s Business Solutions Team is keen to work with local businesses supporting every stage of their growth. For further information please contact the Business Solutions Team on 028 92 509 7383.